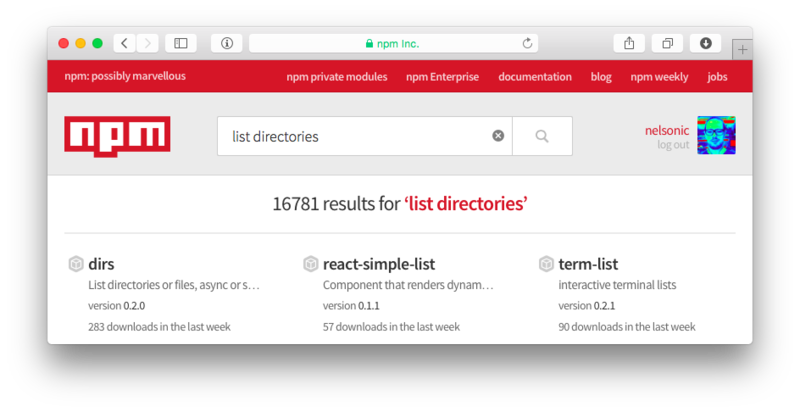 List Directories asynchronously in node.js. We needed an easy way of listing all the directories in a project so we could watch them for changes. Given an initial directory (e.g. the Current Working Directory) give me a list of all the "child" directories. console.log(err); // handle errors in your preferred way. console.log(list); // use the array of directories as required. But way too many people use it as a crutch instead of understanding how to write their own asynchronous code. We have deliberately avoided using async (the module) here, and as a result, listdirs is faster (we benchmarked it!) and includes less bloat. We have included one dependency on isdir for the sake of splitting out code into "does-only-one-thing" (micro-modules) but isdir has zero dependencies so we know the stack! dirtree: https://www.npmjs.com/package/dirtree comes really close to what we want! except it returns a tree object where we want a simple array. dirs: https://github.com/jonschlinkert/dirs unclear docs. uses async (=== lazy). Highly recommend reading the Unix Philosophy if you haven't already.